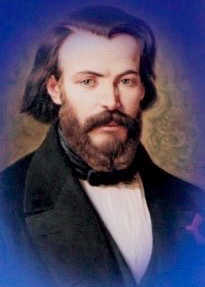 "Blessed Frédéric Ozanam" was born on April 23, 1813. While still a student studying law in Paris, Ozanam took up journalism and contributed to a French Roman Catholic daily newspaper. While still in college Ozanam and his friends revived a discussion group called a "Society of Good Studies" and formed it into a "Conference of History" which quickly became a forum for large and lively discussions among students. Their attentions turned frequently to the social teachings of the Gospel. At one meeting during a heated debate in which Ozanam and his friends were trying to prove from historical evidence alone the truth of the Catholic Church as the one founded by Christ, their adversaries declared that, though at one time the Church was a source of good, it no longer was. One voice issued the challenge, "What is your church doing now? What is she doing for the poor of Paris? Show us your works and we will believe you! 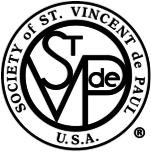 In 1833 Frederick along with other young men founded the Society of Saint Vincent de Paul. They developed their method of service to the poor under the guidance of Sister (now Blessed) Rosalie Rendu, D.C., who was prominent in her service in the slums of Paris. Ozanam died in Marseille on September 8, 1853 at the age of forty. The Society's 160,000 trained volunteers in the United States provided 11.6 million hours of volunteer service in 2015, helping more than 14 million people through visits to homes, prisons and hospitals at a value of nearly $1 billion dollars. During Pope Francis’ recent visit, he reached Christians and non-Christians alike with his message of helping others. The Society of St. Vincent de Paul has been putting these words into practice for 170 years. SVdP is truly volunteer driven with a volunteer to staff ratio of 16 to 1. Our Society was formed under the direction of Fr. David Adams in January of 2002. We are a 501(c)(3) non-profit organization that serves individuals and families primarily in the Gull Lake, Galesburg-Augusta, Comstock, Parchment and Borgess/St. Mary areas. This year we will be donating nearly $40,000 in direct financial assistance to individuals and families. Additionally, more than $10,000 in food items will be distributed. Our Committee members are all un-paid volunteers insuring that the money donated goes directly to those in need. As part of our mission volunteers will do home visits. Financial support for the needy is essential but helping people with ther emotioanl and spiritual needs are equally important. Our mission is not always easy. It can be emotionaly and spiritually challenging. However, we know that Jesus loved and served the poor and challenges us to do the same.